Yes we all need it, and yes it can take up room, but if you run out this is an emergency! I always find great deals on toilet paper at grocery stores, of course they are MASSIVE bags, like 36 rolls and awkward to get in your car and then home, but now what? This is great I got a deal but storing them is another issue, so I try to keep as many rolls as I can right in the bathroom. Having them down the hallway is not going to help anyone sitting in the bathroom looking at an empty toilet roll, so trying to find unique ways of storing them can be fun. Take a look at your bathroom and decide if you have a tiny bit of floor room or if you need them out of your sight, then check a few of these ideas out below. I thought this one was really cute and yet elegant at the same time. If you are going to store your toilet paper in plain sight why not have something whimsical, funny or cute? It is made from sturdy cast iron. If you are trying to create a bathroom that expresses your personality and decor, whimsical, funny or different works! If you don't mind your paper on display, this unit will hold at least 3 at a time plus the one in use. So when it gets to that last roll you know it is time to refill. 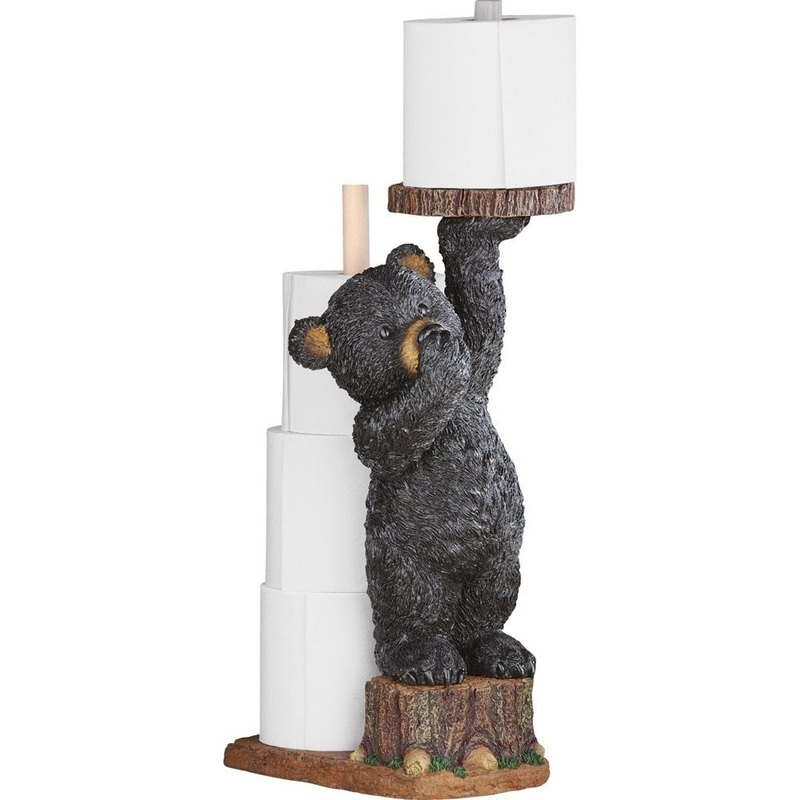 This will fit in that tiny space between the toilet and wall or vanity. Very simply and unique looking in design. Keeps them off the floor. If you want something a bit more comical, or whimsical for your toilet roll storage and figure because it is on display it might as well be cute, this is a unique idea. It will hold the one in use as well as 3 other rolls behind it. Sure to make you smile every time you go in the bathroom. This one is very popular. So don't hide this one, have it where it can be seen. Maybe in your bathroom there is not the room for even the one toilet roll. If you don't have the wall space or the floor space to keep a roll handy especially the one in use, you can use the toilet itself as a holder. This simply slides into the tank so that it is ready and waiting at the side of the toilet tank. This unit sits on the floor and holds 6 rolls of standard toilet paper, but also has a basket for your magazines or reading materials. There is the roll in use and the others slide onto the pole behind it. A lot of storage for a small amount of floor space. No more magazines on the vanity or beside the tub and toilet, they have their place now. This one is very popular, and perfect for renters as you can simply take it with you. If you want to hide your toilet rolls and take them out of the bag you purchased them in, these dispensers take up very little room. They use the vertical height under your sink and in your vanity. But they can also sit totally on there own on the floor too, but I thought this was perfect for the vanity and it creates a little shelf on top for other items you may need to store. You could get a couple of these units and store at least 12 or more toilet paper rolls. This unit is tall but slim and can hold many rolls. 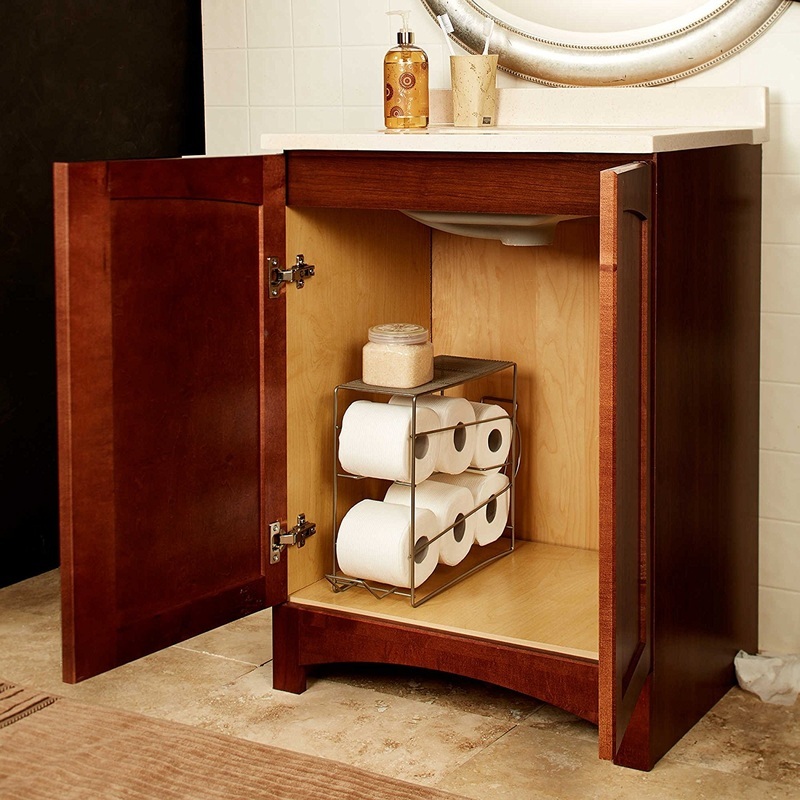 If you want all the rolls stored in your bathroom, this unit will fit between the sink and toilet or the wall and the toilet. They are easy to get at, and you can use the surface for decorative items or magazines, or other storage. 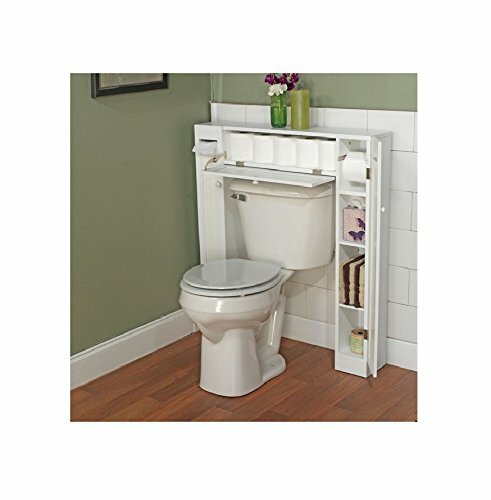 This unit is more along the lines of my over the toilet storage page, but this one is shorter, doesn't take up vertical wall space which is perfect if you have a window or something else over your toilet. But it does have a flip down door where you can hide all your toilet tissue rolls. Plus some hand storage at the sides for other things. If you don't like the paper on display or you simply find it neater to keep it hidden, this works well. This is sold as a pair and they both have feet so that they are not directly on the floor. The toilet roll holder holds 3 rolls of paper and the toilet brush has a cup in bottom so there are no drips to help air dry the brush. But essential in the bathroom, but I really thought this set was unique and elegant looking. They don't take up much room. Just as a side note, I use these in my smaller two piece bathroom. 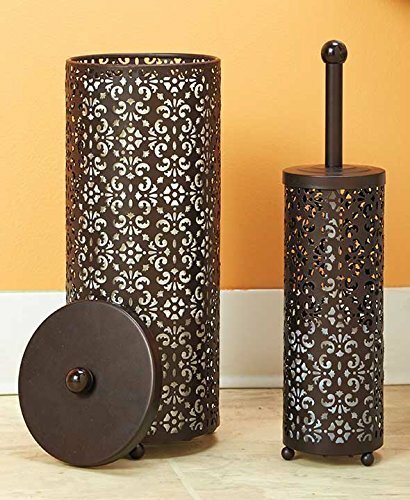 You put your toilet paper rolls onto these instead of the standard one and they deodorize every time the paper is used. It is a gentle scent that I really like. Works best with the wall hanging dispensers. Just in case you were looking for a discreet way to deodorize you bathroom. If you rent your space, I have found many landlords to keep the room so simple there simply is not the storage that most people need. But because it is rented, the landlord doesn't want you doing renovations or constructions without him hovering over you. So you have to get creative with storage, and bathrooms can be tricky depending on how big the space is. If you are lucky enough to have a vanity, you can fit a lot of things under the sink, but if not, you can get portable vanities that simply roll under that pedestal sink, or over the toilet storage cabinets that are awesome and give you that extra storage space from an otherwise unused area. Storing cosmetics on top of a small vanity can be limiting too, or your electrical things such as hairdryer and curling iron storage. But there are ways to do this without putting a single hole in the wall. Hopefully I have inspired you to get creative with your bathroom storage. First step is clean it out, get rid of things you don't need, then figure out the type of storage that works best for you. I have rented many times, and I have always found Amazon to be the perfect place to research and shop, there is just so much more to choose from. So turn your plain rented bathroom into something that works for you, and even if you own your space, renovations can get expensive, so check out the storage options available before you get out that hammer!